For nine years, Forbes has ranked the 100 most powerful women in the world. These are the women who adhere to the traditional classifications of power (political and economic might) and those who have risen to the top of the social and cultural landscape. It is our annual snapshot of women who impact the world. This year the list features eight heads of state -- including our No. 1 on the list, German Chancellor Angela Merkel (pictured here), 25 CEOs who control $984 billion in revenues and 11 billionaires -- including the richest woman in Silicon Valley, Laurene Powell Jobs. We feature some dozen entrepreneurs and 10 celebrities who do more than look good: they're philanthropic do-gooders and entrepreneurial go-getters. Here, a guide to Forbes Power Women 2012. The new class of CEOs: Seven new CEOs seized the corner office this year, and many of them are familiar faces. Marissa Mayer traded her VP post at Google for Yahoo! Meg Whitman, former eBay CEO is now heading up HP, and Sheri McCoy, who was edged out of the top job at J&J is now at Avon. There are also the in-house promotions: Ginni Rometty at IBM, Maria das Gracas Silva Foster of Brazil's natural gas behemoth Petrobas, and Rosalind Brewer, who was promoted to the top of Sam's Club, making her the first woman and first African American head a Wal-Mart unit. Time Inc., alternately, looked outside its Rock Center headquarters and tapped Laura Lang, former head of Digitas. Where are the women in tech? Right here. Tech is a new category to the Power Women list this year as the latest link in the power chain. Six tech women made it to the top 25, including Facebook's Sheryl Sandberg (No. 10), Rometty (No. 15), and Google's Susan Wojcicki (No. 25). There are 15 tech women in total this year, including also Cher Wang of HTC (No. 56) and SingTel's Group CEO Chua Sock Koon (No. 74). The rising tide of female entrepreneurs: A remarkable number of women are founders or owners of their own enterprises, not a few of whose eponymous companies are synonymous with disruptive technology and innovative fashion. Consider Oprah Winfrey (No. 11), Arianna Huffington (No. 29), Diane von Furstenberg (No. 33) and Miuccia Prada (No. 67). Or Chinese real estate tycoon Zhang Xin (No. 42), Zara founder and billionaire Rosalia Mera (No. 54) and Kiran Mazumdar-Shaw, India's first biotech entrepreneur (No. 80). The new celebrity role models: Sure they're famous but they deserve special attention for their outside work, be it as ambassadors to meaningful causes and or as owners of thriving businesses: Oprah both owns Harpo Productions and founded The Oprah Winfrey Leadership Academy for Girls. Lady Gaga (No. 14): she sings, she tweets and now she started The Born This Way Foundation, with funding from Harvard University and the MacArthur Foundation. Joining the efforts of the U.N. are Shakira (No. 40), Angelina Jolie (No. 66) and Gisele Bundchen (No. 83). Beyonce (No. 32) rules the House of Dereon and Sofia Vergara (No. 75) co-owns LatinWE. Jennifer Lopez (No. 38) is a multi-tiered empire. Billionaires who do more than count money: Wal-Mart heiress Alice Walton (No. 43) could've stayed in Texas and raised cutting horses but she and her fellow heiresses are putting their 10 figure bank accounts to good use in philanthropy and business pursuits. Powell-Jobs (No. 49), a first-timer on the list, is the founder and chair of the Emerson Collective, a nonprofit which helps entrepreneurs advance social reform. Chan Laiwa (No. 79), like Walton, has put her focus on preserving the finest of her nation's original art. Feeding, healing and educating the world: If they're not heads of corporations or state, the women on our list are heads of major nonprofits and NGOs and they wield as large budgets and impact millions, from Melinda Gates (No. 4) and IMF's Christine Lagarde (No. 8) to WHO Director-General Margaret Chan (No. 37), World Food Programme Executive Director Ertharin Cousin (No. 69) and and Harvard President Drew Gilpin Faust (No. 63). Social Currency: Of the 100 women on our list, almost all of them are active on social media-with a combined 90 million twitter followers. The most prolific tweeters, not surprisingly, are celebrities-Lady Gaga with 28,199,061; Shakira with 17,716022; Oprah with 13,180,843; Ellen DeGeneres with 12,842,222; JLo with 10,239,010. In China, where Weibo is the social site of choice, entrepreneur Zhang Xin has racked up 4,118,029 followers. The world's No. 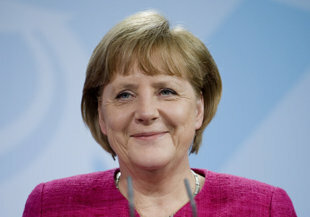 1 Most Powerful Woman for the second year in a row, German Chancellor Angela Merkel is the "Iron Lady" of the Europe and the lead player in the eurozone economic drama that continues to threaten global markets. As Greece, Spain, Italy and Portugal have teetered on the edge of an economic brink, she has vowed to do everything in her power to preserve the 17-country EU. In keeping with her reputation as a no-nonsense diplomat, Hillary Clinton is spending her final months as Secretary of State far from the campaign trail. Much of that time has been on the go: this year alone she's travelled to 42 countries. The president of the world's sixth largest economy is ambitious at the mid-point of her first term, launching two aggressive programs meant to reverse the still-strong but shrinking national GDP. A June poll put Rousseff's approval rating at 77%, and she is predicted to win a second four-year term in 2014. When you have your name on the top of the world's wealthiest and most generous private foundation, challenging the Vatican to reverse its position against birth control makes news. This summer Melinda Gates, a practicing Catholic, vowed to dedicate her life-- an additional personal $560 million--to improving access to contraception to women in some of the world's poorest countries. In year one as the first woman at the top of the New York Times masthead, Jill Abramson has shuffled senior editorial staff and captained the 161-year-old publication through an ongoing digital transformation. Now behind a paywall, NYT.com has recruited nearly half a million paid subscribers and attracts 44 million unique visitors worldwide each month. Sonia Gandhi, the longest serving chief in the Indian National Congress Party history, has had to defend herself and the party after a spate of key assembly elections this year, blaming the drubbing on weak candidates and state party organizations. Last year the 65-year old widow of Rajiv Gandhi, the one-time heir to the Nehru-Gandhi political dynasty, successfully underwent cancer surgery. More popular than her husband in this important election year, Michelle Obama's positive approval ratings register at 66% while POTUS's term average has hovered just below 50%. The First Lady keeps a high profile with her mission to end childhood obesity, her commitment to military families and her stylish fashion picks. The first woman to run the IMF has spent much of her first year on the job battling the debt crisis in Europe. She's been pushing for debt-sharing and an increase in rescue funds from the European Union but has faced resistance from fellow power woman Angela Merkel, Chancellor of Germany. The first female head of the Department of Homeland Security, a position she took after serving as the first female governor of Arizona from 2003 to 2009, Janet Napolitano is at the helm of the third largest department in U.S. politics. After four years as Facebook's COO--and shepherded the company through its much anticipated and critiqued $100 billion IPO in May--Sandberg was named to the social network's board of directors in June. She is Facebook's first female board member and owns nearly $1 billion of unvested stock in the company.